The benefits of placing a portion of the crops fertilizer needs in a concentrated band at planting have long been recognized. Placing some of the needed P, N, K and other nutrients near or with the seed at planting can result in a large early season response that results in quicker canopy cover, reduced soil evaporation, decreased erosion potential and enhanced completion with weeds. Several factors affect response to starter fertilizer. Soil conditions that increase the likelihood of response include cool soil temperature at planting and root growth restrictions such as soil compaction, soil acidity and soil salinity. The response to P and K is usually expected to decrease as soil test levels increase. However, this may not always be true with starter applied P and K as these stress factors (soil temperature, etc.) can overshadow the effect of soil test level. So starter fertilizer may be beneficial where early cool, moist soil conditions prevail, even though soil test P and K levels are high. Getting a response to starter P (fresh P) is common, even when soil test levels are high. Where soil mineral N is low due to good yields previously, dry summers, late breaks and low soil organic matter, early N - at or very near seeding - will greatly assist with early growth. There are synergistic effects among nutrients in starters. For example, N and P work together in a band. Nitrogen, in the ammonium form, results in the production of acidity in the zone of soil right around the root. This can increase P uptake within the same band. Nitrogen and P can cause roots to proliferate in the zone where starter fertilizer was applied. Potassium does not proliferate roots, so co-application with N and/or P is needed for roots to more fully explore the K supply in the starter. Phosphorus also supplies needed energy early in the plant for the active uptake of K.
Of course, care should be taken with placement of fertilizers near seed - where damage can occur particularly with N containing products. Placement in a 5*5 configuration (5 cm to the side and 5 cm below the seed) is the standard for starter fertilizer. Early in its development, corn (for example) has roots that grow down and to the side, at approximately a 45-degree angle. Nutrients placed 5*5 are well placed for access by the young root system. But, because of factors such as equipment cost, time and residue a 5*5 system is not the easiest to implement. One study (Gordon, 2009. Better Crops, Vol. 93, No. 2) has indicated that a “dribble” 5*0 (surface applied 5 cm from the seed) application can perform approximately as well as 5*5. When averaged across several starter formulations, each configuration increased significantly increased yield. The most commonly observed effect of starter fertilizer is more rapid early season growth. This effect alone has benefits (as described above), but it does not always guarantee increased yield. As a plant continues to develop its roots explorer more soil, so the dependence on starter applied nutrients is diminished with time. End of season yield response depends on how quickly and to what extent a plant root system accesses other supplies of nutrients in the soil, which is in turn related to the degree of stress in early season. Under conditions where root exploration is limited or slowed, yield response is more likely. 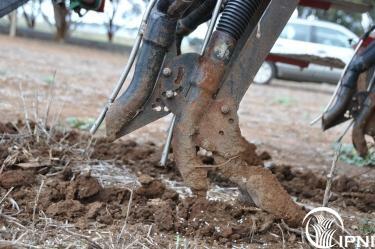 The use of starter fertilizer is an effective management practice that is based on sound agronomic principles. But in most cases it should not be the sole fertility program. The best approach to starter is to view it as a catalyst that promotes rapid and uniform growth for a crop that will have adequate and balanced available nutrients in the soil rooting volume as the season progresses. Adapted for Australia from an article written by Dr Mike Stewart, IPNI Mid-west.